Updates on our Babies, and more! I wanted to let everyone know that ALL our babies are doing great! The two newborn squirrels have done well, tripling their weights and are no longer in critical condition, in the very capable and loving hands of Lucy Burlingham. The opossums are all growing by leaps and bounds – and oddly, they are STILL blonde! We thought their yellow coloration was due to dirt but after bathing them, they are still blonde. It will be fascinating to see if they keep this coloration as they mature. Blondes do have more fun, right? In addition to the babies we have written about above, we have received in many other babies, including more baby squirrels and opossums. 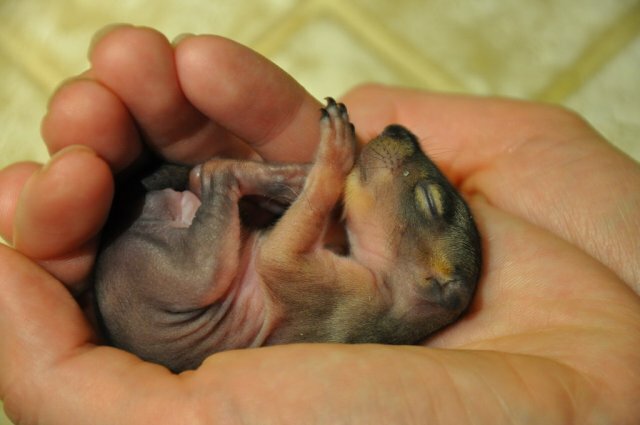 One of these baby squirrels was found when his nest fell out of the tree and onto a parked car! The owner of the car was a kind man from El Cerrito, who stood back and watched as the mother squirrel, in a panic, after falling with the nest and injuring her leg in the fall, carried off one of her babies to her “backup” nest (mother squirrels always have at least one backup nest). It usually takes 15 minutes for a mother squirrel to relocate each baby in a nest, and this mother was moving slowly due to her new injury. The man needed to move his car so he had to remove the nest from his roof. He placed the nest at thebase of the tree and drove off, but he called us to alert us to the problem right away. An hour went by and it was starting to get dark. The mother had been unable to return for her remaining baby. The wind had blown the nest into the gutter. Luckily, the man had returned and retrieved the remaining baby from the nest before darkness fell and a car drove over it. We met him at the location and took the baby into care. This baby is doing great in the very capable and loving hands of Lucie Moses and her family. Thank you to the good sameritan from El Cerrito, and to Lucie, Dean, Felix and Milo for their hard work caring for this sweetheart – and the other sweetheart they have as well. Their other sweetheart was found by a caring community in Berkeley. They witnessed the nest fall from the tree in their backyard. Two babies fell, one into the creek, swept away by the fast current, and the other clung to a ledge overhanging the creekbed 10 feet below. They were able to climb out and retrieve the lone survivor and cared for him by warming him and wrapping him in soft blankets while they searched the internet for what to do with him. They called us and we were able to take him into care, where he has thrived. Now he and the El Cerrito baby snuggle togetherin a nest that is human-made, growing and sleeping. Their eyes are still closed but they are getting nice and furry. The other babies are doing well also. 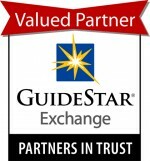 Or make a donation online using a credit card or bank draft via Paypal from our DONATION page. Thank you for your interest. Please check back regularly to see our latest patients and exciting news!